Want protection that really lasts? Using a high-tech polymer that was originally developed for a different market, Bayer has created scientific approach to residual protection. By coating polymer onto the active ingredient (Deltamethrin crystals), Bayer developed a controlled release system that provides a full 90 days of residual protection from over 50 household nuisances. In the long run, this means less required applications resulting in cost savings. Let’s now explore how it works. Bayer’s research department first experimented with many types of polymers to include into their formula for a longer lasting residual. When they noticed that most didn’t quite cut it, they turned to look into their existing polymers and found one that addressed some of the common challenges met by insecticides today. Surfaces such as wood and mulch absorb insecticides, making their active ingredients unavailable for pests to come in contact with it. Cement, on the other hand, contains a high alkaline surface that can accelerate the rate in which active ingredients break down. With a polymer coating, the Deltamethrin crystals now adhere themselves on to even the most porous and rough-faced of surfaces (allowing them to stay where applied.) The polymer coat also acts as a shield that protects the crystals from weathering, irrigation, and mechanical abrasion. This, in turn, greatly reduces the amount of chemicals being carried away from the targeted area. As much as 92.5% on tile, and 74.3% on concrete (when compared to a leading microcap formulation.) The added shield doubles it’s function by slowly exposing more of the Deltamethrin particles, as the polymer coat erodes over time. The controlled exposure Suspend Polyzone leads to an extended efficacy window. A full 90 days of protection from over 50 different kinds of invertebrates — 30% more than standard microcaps. 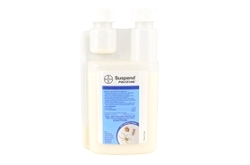 Suspend Polyzone also offers a more even distribution of the active ingredients than ever possible by the leading microcap solution, ensuring that a treated area will be well fortified against any incoming intruders. Thankfully, this formulation is safe enough not to damage plants, paints, fabrics, or other surfaces where water alone causes no damage. Use a pressurized continuous action sprayer to apply concentrated chemicals. Since Suspend Polyzone is a concentrated chemical, a continuous action sprayer is required for application. For demonstration purposes, we will use the SureSpray 1 Gallon Sprayer, featured on our website. Step two: Measure the appropriate portion and add it to the container. Step four: Open the container once more and fill the remaining capacity slowly, to avoid spills. Once closed, give it one last shake before applying. When we first heard about Suspend Polyzone, the entire office wanted to find out how well these features work in the real-world. Charlie Asberry, a service manager of All-Rite Pest Control in Lexington, Ky., claims he had 4 callbacks after 150 applications compared to 23 callbacks with a different pyrethroid product. Suspend Polyzone can be purchased online at bedbugsupply.com. When battling the evolving world of insects, put the science of Suspend® Polyzone® to work for you. Remember to always read and follow the product’s label, and msds, to ensure safe and effective usage. Ants, bed bugs, boxelder bugs, brown marmorated stink bugs, carpenter ants, carpet beetles, centipedes, clothes moths, cockroaches, crickets, earwigs, firebrats, fleas, flies, fruit flies, gnats, hornets, millipedes, moths, multi-colored Asian lady beetles, pillbugs, scorpions, silverfish, spiders, ticks, wasps, yellow jackets and more. Refer to the label for a full list. Suspend Polyzone features a polymer coating that protects the active ingredient from weather and irrigation. This controlled release formulation, ensures your treatment will continue to control targeted pests for up to 90 days outdoors.